Realizing what had happened (and, most importantly, that I had not contracted some horrible illness), Angelique began laughing, too. She was fascinated by the strange new pigment of my skin and asked me a thousand questions. Comically, I suppose that I could say that Angelique and I ultimately became best friends over sunburn – but there is certainly something more to it than that. At that singular moment, we both became aware that despite our vast differences of experiences and culture, we could find common ground. It set a precedent for acceptance and appreciation of one another – as our differences were something that we could learn from and even laugh about; not a reason to feel self-conscious or threatened. When I think back on that experience of Angelique’s first introduction to sunburn, I am always reminded of a scene in the documentary, God Grew Tired of Us. This particular documentary focuses on the stories of a few of the so-called Sudanese Lost Boys, who are given the opportunity to come to the United States as refugees. Although it covers some of their past, it mostly focuses on the difficulties of transition, especially the cultural difficulties of transition. The scenes which I will never forget are as the Lost Boys travel from their home refugee camp in Africa to the United States and their bewilderment as they encountered manifestations of modernity, which they had never seen before: escalators, automatic water faucets, intercoms, butter packets in the airplane meal tray, etc. It was with this powerful documentary in mind that I purchased “They Poured Fire on Us From the Sky” on sale at the World Bank Bookstore in Washington DC. (Just for the record: this place has the best books and the best sales ever! I never walk out with less than three books!) 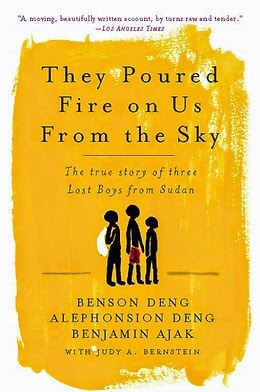 I had already read a book about both Sudan and South Sudan, but I felt compelled to read this book, which is a combination of the three distinct (yet inter-connecting) memoirs of Benson Deng, Alephonsion Deng, and Benjamin Ajak. It was written with the assistance of Judy A. Bernstein. The Lost Boys is a term that refers to the over 20,000 young boys from the South Sudanese Dinka and Nuer tribes who traveled by foot across Sudan to escape the destruction of their villages during the Sudanese Civil War (from 1983 to 2005.) They fled to refugee camps in both Ethiopia and Kenya, respectively. This book covers the stories of three of these boys, who experienced many hardships and saw the deaths of many of their friends. All in all, I would most certainly recommend this book – not so much for its academic content, but rather for the comprehension and insights it provides into being a child of war and without a home. With so many wars going on in the world, we often forget how many children are affected every single day. This book provides a powerful – albeit brief – reminder of the sad realities of so many.